Hello All. Welcome to another Insecure Writer's Support Group Wednesday. If you don't know him already, make sure you jump over to Alex J Cavanaugh and say hello. 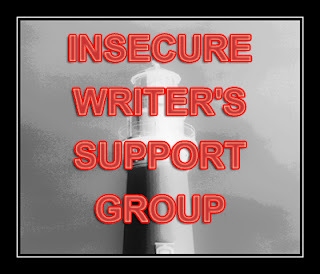 Also, check out the IWSG website and hosts for this month. I wrote my title as (In)Secure because I am both, have been both, will continue to be both, and have now accepted it fully. I'm making an effort right now to not apologize for many things not happening around my little blog here. It's actually quite hard for me. But I've realized I need to stop apologizing for things I haven't done yet and just get to getting them done. And that brings me to what all I've been working on this past month. I got caught up on crits and since I was really freaking behind, it took a lot of catching up. I've been reading, a little editing here and there when I can squeeze it in, a few too many doctor appointments, way too much non-writerly work...but most of all, I've been working on regrouping, refocusing, rethinking, reinventing. I needed to decide where I'm at, where I've been, where I want to be and what I did right and wrong in all those stages (or what I need to do). I've realized a lot about myself, things I lost and for the good, things I lost for the bad, and things I lost, found, and need to lose again. I don't know how many people really still pay attention to my blog, but I do know there are a good handful that have stuck around through all my crazy ups and downs. I've met a lot of people by stepping out into the social part of writing, some of those were nothing but a light breeze that came and went. Some came and stayed until they ended up lost themselves (if only I could figure out how to pull them back on track with me). And some of you came, stayed, and support me through it all. I appreciate that. Those who are still here, are the ones I look up to. I aspire to find the awesome balance you have. I dream to one day be as awesome as Alex, as involved as SC, and as kind as TJ. Those are just a few people who come to my blog through all my flakiness and talk to me on Facebook, AQC, and Twitter. I truly do admire everyone who finds time to be socially active, hold regular jobs and/or go to school, be mother/father/wife/husband/spouse/significant other/etc, and still write/edit/publish/crit/etc--And all while managing to keep yourself from completely losing it. It's difficult, and anyone who accomplishes all of it is really something special. I applaud you, truly. To wrap up this post and bring it back to the IWSG, I'm a little bit of both right now, insecure and secure. I know what I want and what to do to get there, but I also hate that I'm not there already. Regrouping and finding your place, your balance, is good. Although I don't think any of us are where we really want to be. And I'm so busy I don't have time to lose it. Good to hear from you Kela. Having insecurities is healthy; without it, we'd never really want to get better. Balance is always key. Thank you for your kind words XD You are fantastic as well, don't you forget it. You are already all those things :) Things get lost, life comes first, and one day, you'll be where you want to. Just remember, it doesn't require huge leaps, only itty bitty steps. You're right. Sometimes I feel secure and sometimes I feel insecure. ;) It's part of life, I suppose. Thanks for a great post! Sometimes we all need a moment to think about where we currently are and where we're going. I hope your reflection is very productive. Great IWSG post! Hi Kela! Stopping by for IWSG and boy am I glad I did! This was a great post, and all things I have felt recently. As a mother and writer (not yet published author), I feel the weight and pressure of trying to get my novels "out there", but sometimes become overwhelmed by it all. Life is a roller coaster, always up and down and the most unexpected turns. Feeling insecure is a healthy part of those downs, feeling great and secure come with the highs. Enjoy every part of it for without the bad, we would never appreciate the good.